At Broughton the children are keen to represent our school in competitions and in the past have done extremely well; most notably winning the Handball and Gymnastics competitions last year! This year we have again entered a variety of competitions. Please see below for competitions and dates. Children selected will receive a letter home 2 weeks prior to the event. 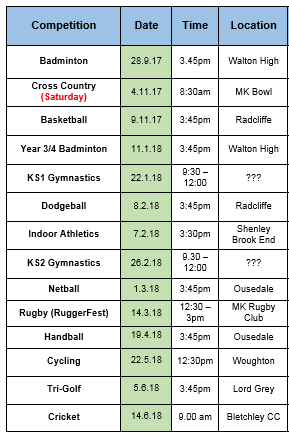 Last year we entered a number of leagues and competitions to allow the children the chance to show their excellent sporting ability in a competitive environment.